Pop Culture Passionistas: A “Lost in Space” Reunion for "The Bolt Who Screwed Christmas"
A “Lost in Space” Reunion for "The Bolt Who Screwed Christmas"
Santa Barbara based filmmaker John "Wedge" Wardlaw was working at his brother's company, Specialty Tool and Bolt, when his friend Michael Wilcox made a simple suggestion, "We should make a movie about nuts and bolts." The result, an animated short that Wardlaw wrote that very night called The Bolt Who Screwed Christmas, will be screened at this year's Burbank International Film Festival. How the Grinch Stole Christmas fans will love the homage to Chuck Jones' holiday classic but sci-fi fans are in for a treat, too. The film features the final performance of Lost in Space villain Jonathan Harris and marked a reunion of his co-stars Bill Mumy, Angela Cartwright, and Marta Kristen. In our exclusive interview with Wardlaw (after the jump) he talks about working with the legendary cast, the process of making The Bolt Who Screwed Christmas, his favorite Jonathan Harris story, and what's next for this creative filmmaker. JOHN: I made my first film when I was about 12 or 13. JOHN: I found a super 8 (that's film for those who don't remember) camera in my mother's closet. It had belonged to my grandfather who had recently passed away. I asked, no, I begged my mother if I could have the camera and make a movie. I must have loved it because I made 20 films before ever going to film school. JOHN: That is such a difficult question because there are different influences for different genres. For live action films I would have to say Clint Eastwood is one of my favorite directors. I am also a huge fan of Star Trek (all of the series and most of the movies) and other science fiction shows like Babylon 5 and Farscape. As for comedy I love Monty Python and the original Pink Panther films starring Peter Sellers. However, my love for comedy is deeply rooted in the cartoons I grew up on, mostly Bugs Bunny directed by Chuck Jones and Friz Freleng. PASSIONISTAS: What inspired you to make a parody of How the Grinch Stole Christmas? JOHN: You know, it just kind of happened. When I sat down to write a script about nuts and bolts the first thing that came to mind was The Bolt That Stole Christmas. Then I realized I had the chance to make a parody of something that Chuck Jones did. JOHN: The characters were all designed by animator Adny Angrand. They are all his creation though I had instructed him to give them a bit of that Chuck Jones classic Bugs Bunny era look. Plus they had to resemble their Grinch counterparts as well. I really can't draw so I gave him basic instructions on what I wanted. I described the dog with the Nut for a collar and I made sure that all the male Screws had Phillips heads and all the female Screws had, uh, slots. JOHN: Two years or twelve years depending on how you look at it. I wrote it in 1998 but I didn't record Jonathan Harris and Tress MacNeille until 2001. Animation didn't begin until 2005-06. But if you put all the hours together then we probably spent around two years actually working on it. PASSIONISTAS: How did you get the Lost in Space cast members to participate in the project? JOHN: I asked them! Honestly, if you are a filmmaker and you want to work with someone, be professional and ask. The worst thing they can say is "No." Of course, I broke my own rule. I happened to know where Jonathan Harris lived. So I mailed a copy of my script to his house. A while later I received a handwritten note saying that his performance as the Bolt was possible and that his agent was expecting my call. While talking to his agent I was asked if I needed any other voices and he mentioned Bill Mumy. He felt that Bill would like to work with Jonathan on a small project like this. At that time the script didn't have any other male characters so he offered up the name Tress MacNeille. How could I turn down a name I saw at the end of every Simpsons episode? It wasn't until after Harris passed away that I approached Bill Mumy, Marta Kristen and Angela Cartwright about being in the film. I wrote the scene specifically for them. Considering that there are five characters in the scene I created I did consider asking June Lockhart and Mark Goddard to be in the film as well. PASSIONISTAS: Why didn't you approach June Lockhart and Mark Goddard? JOHN: At that stage of the film I was really worried about my budget. I financed this film myself and I had just hired Bill, Marta, and Angela. So I was concerned about how I was going to afford to finish the film. There were also the logistics of it all, Bill, Marta, and Angela are local to the area while June and Mark were not. I am completely happy with the film the way it is but I have to admit it would have been kind of awesome to have worked with them all. PASSIONISTAS: Can you tell us about the recording session with Jonathan Harris? JOHN: It was wonderful. What a wonderful man. The studio wasn't ready for us (myself and Michael Wilcox) when he arrived so [Harris] said something like, "Then let me tell you some stories." He proceeded to tell us about various aspects of his career. Yet nearly everything he told us had some meaningful insight within. While it may have sounded as if he was just talking about his life it was more like advice through storytelling. He also showed a lot of interest in the script, which he had already marked with various notes. His performance was exactly what I was looking for. Considering the original film featured Boris Karloff, I really needed a distinctive voice. We did three takes and that was all we needed. At the end I asked him if he would read one scene a different way. He said "No. You can't do that." As the director I wanted to have this one option for this one scene so I asked him why. All I remember is that he was right. It wasn't going to work. But he was a professional and did it anyway saying something along the lines of, "I know you won't use it anyway." I can't say enough about what a great experience it was to work with him and how genuinely kind he seemed to be. 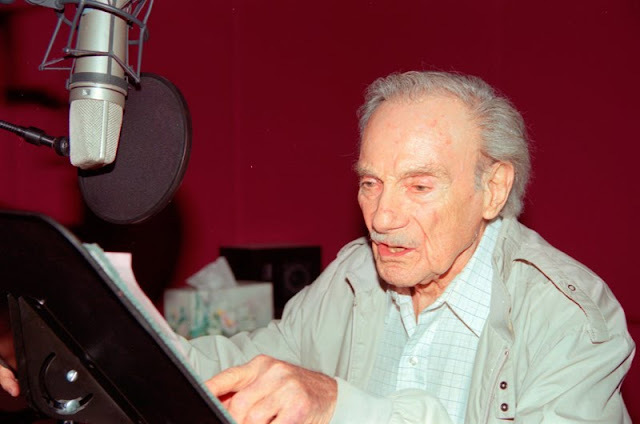 PASSIONISTAS: Do you remember what your favorite story was that Jonathan Harris told you at the recording session? JOHN: He was telling us about the first few days of working on Lost in Space and how his character of Smith was to be killed off early in the series. He said he thought to himself about how he could keep this character and job alive. So he started to improv his lines during some of the takes. One of these improvisations happened to include the melodramatic "Oh, the Pain!" After one of these takes Irwin Allen walked up to him and looked him right in the eyes, brought his hand up right under his nose and pointed at him and said, "DO MORE!" Of course, you have to have heard Jonathan tell this story to get the full impact, but it was quite entertaining to hear. PASSIONISTAS: Can you tell us about the recording session with the other Lost in Space cast members? JOHN: Bill, Angela, and Marta were already in a room together when I met them. They were having a bit of a reunion when I entered and we were all introduced. I don't remember how it started but Bill did some wonderful impersonations of Jonathan and the Robot having a conversation. Then they went into the booth and I had them listen to Jonathan's performance. There were tears and laughter at hearing his final project. The recording session took place on my birthday and went very smoothly. I had Angela and Marta both read for the part of Mrs. Rachet as well as the sisters. Bill read for Knob Ratchet and Tiny Tap. The last thing I asked them to do was record the seasons greetings from the people of Screwville. This started out as you would expect and slowly digressed into the comedy stylings of Bill Mumy. The recording engineer and I were laughing so hard it hurt. Marta and Angela tried their best to keep from breaking up but this just wasn't going to happen. When the session was over they signed some autographs for me and I headed home. What I have truly appreciated since the session is their continued support of the project. It was a pleasure to get the chance to work with them and I enjoy passing along film festival and award updates to them. I am still hoping to get a chance to appear at a film festival with any one of them. Fingers crossed. PASSIONISTAS: Were you always a fan of Lost in Space? JOHN: Ahhh, the works of Irwin Allen. While Star Trek was always my "Number One," I also grew up on the Irwin Allen classics. Voyage to the Bottom of the Sea , Land of the Giants , and, of course, Lost In Space. The Robinsons were the cool family that got stuck out in space with all those monsters and aliens. What kid wouldn't like that. It is funny how Dr. Smith was the character I loved to hate but Jonathan Harris was the actor I loved working with. That cast was loaded with talent. PASSIONISTAS: Do you have any other film projects in the works? JOHN: A few. Adny has completed the animation on our latest project, a short comedy titled No! Not the Chicken! which will be finished later this year. I'm developing a few shorts, some animated and some live action, which are not comedic. And I am also working on a script for a short feature that deals with time travel. If animated, I thought it might be cool to see if I can cast this one with voices from actors who have appeared in Star Trek. Just a thought. PASSIONISTAS: Can you tell us a little bit about No! Not the Chicken!? JOHN: It's a very short animated film about a prank caller who calls Hell and pesters Satan. The audio is taken from the CD No Waves in Hell by my band, Anti-M. The album is a collection of songs, with dialog between them, about a surfer who dreams he goes to Hell and finds there are no waves there. Although the album and its music videos were recorded years ago I had always wanted to animate some of the narrative bits between songs. Having worked with Adny on The Bolt I felt this was the prefect opportunity to bring these characters to life. Now if only I can find an appropriate film festival. WARNING, it's not for children!!! To see a slideshow of images from the Lost in Space cast recording sessions for The Bolt Who Screwed Christmas visit www.examiner.com. This sounds so great. I loved Lost in Space. Harris' Dr. Smith is one of the great TV villains. How cool that John Wardlaw got to work with them and how cool the Passionistas did this article! thanks!